This memorial website was created in memory of our loved one, Eduardo Castro Luque, 48, born on December 12, 1963 and passed away on September 14, 2012. Where Eduardo Castro Luque is buried? 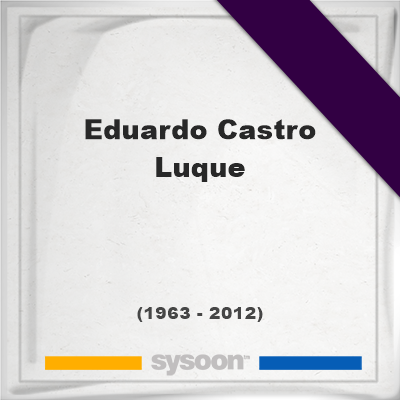 Locate the grave of Eduardo Castro Luque. How Eduardo Castro Luque died? How to find family and friends of Eduardo Castro Luque? What can I do for Eduardo Castro Luque? 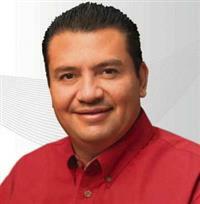 Eduardo Castro Luque was a Mexician politician elected as a state legislature for Sonora in the Congress of Mexico on 1 July 2012. The 48-year-old owned a publicity agency and had never held elected office before. Before running for office, he had served as the marketing manager of the Yaquis de Obregón baseball team in his hometown and was working at his privately owned publicity agency. He was killed in his car outside his home, and two assassins fled the scene on a motorcycle. Note: Do you have a family photo of Eduardo Castro Luque? Consider uploading your photo of Eduardo Castro Luque so that your pictures are included in Eduardo Castro Luque's genealogy, family trees & family history records. Sysoon enables anyone to create a free online tribute for a much loved relative or friend who has passed away. Address and location of Eduardo Castro Luque which have been published. Click on the address to view a map. Eduardo Castro Luque was born in Ciudad Obregón, Sonora, Mexico. Eduardo Castro Luque died in Ciudad Obregón, Sonora, Mexico.